The Venus of Willendorf, as sculpted by Eolith Designs. I do a lot of work for the British Museum and while I was there demonstrating for the Ice Age Sleepover, I was lucky enough to be given a VIP tour of the Ice Age Art: Arrival of the Modern Mind exhibition. The sculptures on display are simply breathtaking, and I would urge you to go see them if you haven’t already. One of the great things about my job is meeting other likeminded people who make a living from working with their hands using the same materials and techniques our ancestors would have used. I’d like to share the work of other small businesses with my visitors and the first in a series of ‘Spotlight’ articles is Cobweb, the artist behind Eolith Designs. Go take a look around his site, and then read on for an interview. What led you to sculpture, especially of archaeological artefacts? Do you have an archaeological background? ‘I spent a lot of my childhood in museums, and stately homes, and it has left me with a deep appreciation of strange and ancient things in glass cases. So some of what I do is driven by nothing more than the desire to have my own collection of strange and ancient things, even if I have to make them myself. I’ve no formal archaeological background, but I’ve always had an interest in the subject. I read excessively and try and keep up with new discoveries and ideas, and I have archaeologist friends. How did you choose which pieces to include as ‘Artyfacts’ in your collection? Do any of the pieces you’ve chosen to recreate have a special significance to you? ‘They all do, but I think Venus is probably closest to my heart. The Venus of Willendorf is most definitely my favourite piece of sculpture ever. She may account for my rather unique view of what constitutes a long time, my belief in human devolution, and my understanding of what civilised really means. She’s absolutely perfect. When we were beginning to think about farming she was already fifteen thousand years old (give or take). I have no idea what or who she was; human, divine, or a little of both. What I do know is she touches me more deeply than anything that’s been created since. That feeling is something I’ve often tried to capture. My first experiment with digital art (long since lost) was a picture of her called “Mother is the name for god on the lips and hearts of all children”. I can’t remember if it was any good, but it probably says a lot that it was the first thing I wanted to paint. I made her into a pendant when I used to make jewellery. She was about an inch long and I did her in bone and bronze finishes. I thought I’d sold them all but last year I found one hidden away in the attic and I’ve been wearing her a lot since then. She was the fourth piece I created for Eolith Designs. The first three had all been very masculine and I needed a break from that. At first I wanted to create a “tribute to” rather than something that looked too much like the original, in the end it wasn’t a decision I had to make. Once I’d started she took over and pretty much made herself. There are only so many ways of doing it as I’m sure her original creator found out. 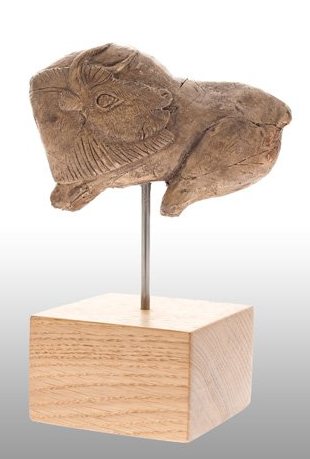 Inspired by a find roughly 14,000 years old, the bison sculpted by Eolith Designs is one of the designs the British Museum are selling. How do you envisage your work being used/appreciated by the owners? ‘It depends on the person and the piece. Most of my work has a historical or mythological basis, usually both, and people tend to approach it from one of those directions. It attracts a peculiar mix of the spiritually and the scientifically minded. How important do you think texture, colour, and the tactile nature of artefacts are? What’s next for Eolith Designs?